This week we stuck close to home as we found a composer to study. I stumbled onto Karl King. A Bandmaster and Composer from Canton, Ohio. He was an only child and a self taught musician. He was eleven when he used the money from his newspaper route to buy himself a coronet. Other musicians in the Grand Army Band of Canton would help him learn how to play brass instruments and he only had 4 piano lessons and 1 harmony lesson in his whole life! He learned to compose music by studying musical scores. One of his most famous pieces is pretty iconic. Listen, tell me if you start craving peanuts and cotton candy after you hear it. I am certain it will make you smile and take you down a memory lane or two. Here is another one that made me smile and made us strut around the kitchen keeping time. Can you imagine how fast those brass players fingers are moving and how their lips look after playing this song? yeesh! After the circus life, King settled down in Iowa where he directed the Fort Dodge Municipal Band for the next 50 years. He died in 1971 at the age of 80. He composed over 300 works comprised of galops(yes, that is spelled correctly,it is the forerunner to a polka), waltzes, overtures, serenades and rags. In addition to that number of works he also wrote 188 marches and screamers. The music of Karl King has a very distinct sound and it is said that he did for circus marches what Sousa did for the patriotic marches. I hope you enjoyed what we learned this week about a composer from Ohio. I thought I would take the time to introduce you to a composer from the north. Here is the music I could find on YouTube. It is a little operatic…. but the music is very sweet. Oh my, I forgot how much fun Scott Joplin’s music is to listen to! I am looking forward to exploring Ragtime in the next week to come. What music is playing at your house? It’s Thursday! Time to share what you are learning about your composers. 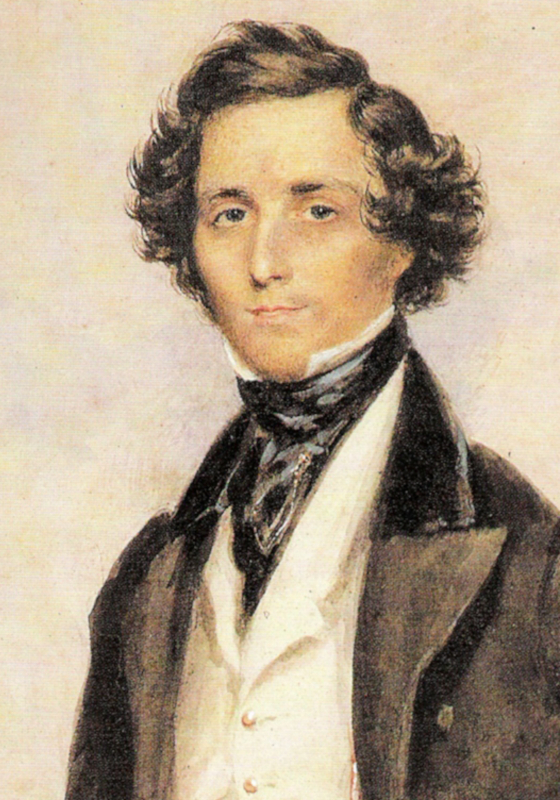 I had absolutely NO idea that Mendelssohn wrote this piece…..
We have wedding on the brain around here. My sister is getting married in March and we have been trying on dresses, working out colors of shoes, consulting in little decorating ideas…. Now when she walks down the isle. We will be able to say we know who wrote that song! Let me know what you think of the new linky…. We finished this years installment of Beethoven… and we are moving over to the German Romantic side of things. We will hang around listening to Jakob Ludwig Felix Mendelssohn Bartholdy; whom English speaking countries refer to as Felix Mendelssohn. Much easier to say… sort of. Smart looking chap isn’t he? He is curly headed like my eldest son. I have a soft spot for curly haired musical types. More information than you needed to know about me, I’m sure. Moving, Stirring, Rousing, and in places LOUD… are words that come to mind. I suggest listening to it at a low volume otherwise the portions written in ff will blow out your eardrums and send to diving for the volume dial mid-overture…. not that I did that or anything, ….just sayin’. Most of our discussion this week was around the specific dynamics that pieces are written in. They range from soft to loud, to SUPER loud. We discussed how music tells a story with the ebb and flow of it’s volume just as much as each instrument does within an orchestra. Did I mention that Hunter got a drum set for Christmas? I think we lost our minds for a moment or two…. But he is really pretty good, especially for a 9 year old, whose mother knows nothing about the drums…and is clearly biased. We are closing in quickly on Christmas. My tree isn’t up. I haven’t wrapped a thing….I HAVE baked up a bazillion cookies…..I told you that Thursdays sneak up on me… and this one snuck right past me. I could share with you the list of reasons why… but they might sound like complaints…. and really you don’t need to know why have bought stock in Ocean Spray. I am neck deep in Sheep for Sunday’s Christmas Pageant….and my couch is covered in laundry. clean laundry… Pretty normal for this time of year. Hopefully you are doing better in the decoration and laundry department than I am. We are plugging along for the month of December… still working on Beethoven. I know it seems like forever we have been studying him, but I want the process to be thoughtful and not just whizzed through to say we have covered this composer. I want there to be a lasting impression, an identification of who these men are and the lives the lived in a time far removed from our own. We studied this week about how Beethoven met Mozart. Mozart felt Beethoven a wee bit passé until he dazzled him with his improvisation skills. That is what caused Mozart to take notice of this young musician. Beethoven, he didn’t care much for Mozart either. Thought that he played a bit “choppy”. Maybe both of these boys needed a Midol the day they met. The book made them sound like cranky teenage girls that couldn’t get along. 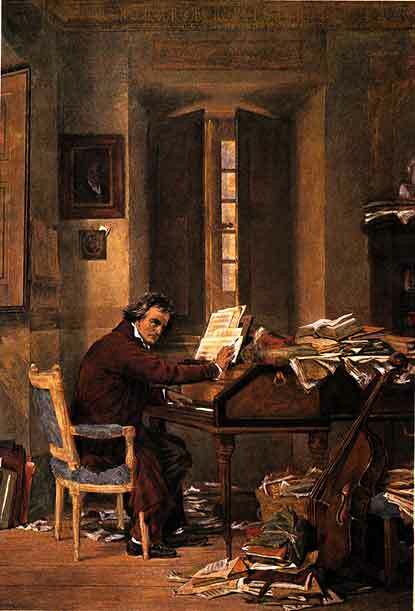 Beethoven rushed home from Vienna to tend to his dying mother. After she passed, then his littlest sister did as well. The boughts of depression that plagued Beethoven began after this time in his life. He was 17. We left our studies this week as Beethoven was the figurative head of the family. He now needed to find a way to support his father and siblings. Music would have to be the way. Happy Thursday! Thursdays sort of sneak up on me. I realize there is one in every week, but we have such full days on Tuesday’s and Wednesday’s, Thursday’s are a calm after the storm sort of day. One of those days I would love to stay in bed for longer….. But alas….that never seems to happen. I guess I should stop blathering, and get back to what we have been doing in our study of Beethoven. We are beginning to leave the tragedy of his early years and progress on to a time in his life where he began to perform out side of the home. At the ripe old age of 10 he was composing. He was writing music his hands were too small to play, yet he knew he would grow and play them later. He was beginning to astound people with his ability to read and play the most difficult of musical scores at first sight. At 14 his father’s voice, the chief source of income for the family was gone. The responsibility now fell to Beethoven to earn a living for his family. At 14? Times are so different now, any given 14 year old now, in affluent western culture, would be hard pressed to earn a living for their family. As we studied this week we compared and contrasted Beethoven’s childhood with Hunters. Very few similarities seemed to be found. It gave Hunter an opportunity to list a few differences that he was thankful for. This picture is courtesy of the SJSU website, Beethoven is preforming for his friends in an intimate setting. Everyone looks so pensive and thoughtful. Listen to this: Violin Concerto in D Major Opus 61 by Beethoven. See if you think it “feels” pensive and thoughtful. As if you could sit on the edge of the ocean, staring into the horizon as the sun sets, and review the tides of emotion in your day, your month, your year, perhaps even your life. I feel a bit like the rabbit from Alice in Wonderland today. I have had a case of Life Happens over here and I have been rushing around, feeling very behind on my growing list of things to do. I sort of forgot that it was Thursday. Hopefully you will forgive my lateness and join in and share how you are studying your way through the composers. As I suspected, this week’s reading was slightly less melancholy, with the exception of how his father and teacher would come home drunk, roust Ludwig out of bed and set him to playing music lessons through the night. I like my sleep. The thought of children being woken needlessly makes me sad. Did you know they changed Beethoven’s age? His father pronounced him two years younger than he was, so people would marvel at his amazingness. By the age of 14 he was to be the sole support of the family. So, how does it go with your composer? We are back to classical composers this week. Starting off fresh with good old Ludwig. Which leads me to a question…. Why do we pronounce his name Bay-toe-ven…. when it is spelled Beet-hoven? Ok, those are some of the random thoughts that plague me from time to time. Aren’t you glad I shared? A few weeks ago our library had a book sale and like any good homeschooling family we trolled the place for stuff we could use. We found a great little book by Pam Brown on Ludwig van Beethoven was just the type of thing we were looking for. So we snapped it up for the bargain basement price of $0.25. This week we learned that Beethoven, like Mozart, was from a family of musicians. In fact, Johann his father, wanted to parade Ludwig around Europe as the next great Mozart. He played his lessons for hours each day. People often saw him weeping from weariness as he played. He was taken from school when he didn’t perform very well and was made to concentrate on music all the more. His mother was a sickly woman and had trouble caring for her family as she should have. Ludwig often wore shabby clothes as a child and probably didn’t have too many baths. His father was known to drown his sorrows and perceived failures in a bottle of drink. Despite all of the difficulties Ludwig was learning to love music. Hopefully next week’s reading will be slightly less…. tragic. This week we studied more about the life of Charles Wesley. We (Hunter dictated, I typed) wrote a 150 word report about him for a project in Master Clubs. We also earned our Christian Music badge this week! Yay! Hunter was amazed at how many hymns he wrote. 8,989 to be precise. He was a missionary to the colony of Georgia. Spoke 3 languages, Greek, Latin, and French. He spent 22 years in school, 13 at Westminster, and 9 at Oxford. Hunter’s favorite hymn, written by Charles Wesley, is Hark! The Herald Angels Sing. With over 8,000 hymns to choose from maybe one of your favorite hymns was written by Charles too. Last Sunday, Hunter played Chimes in front of the church with his Junior Ringers group, and in two weeks he will play the offertory for Sunday night service. Does your child perform music anywhere besides the living room?